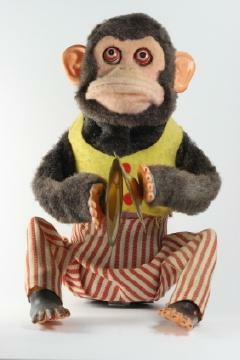 For many toy collectors a monkey playing cymbals vintage toy is a treasured find to add to their toy collections. Introduced in the 1950s by the Japanese toy company, Daishin C-K, the Musical Jolly Chimp became a huge success. During the following decades several toy manufacturers produced variations of the fun loving little chimp. Although the monkeys made by each company wore distinct clothing and had different facial features, each one clanged their cymbals to the delight of their young owners. What Tools Are Used in Sound Healing? The Musical Jolly Chimps, and most of the furry little monkeys that followed under different names, are more than percussion playing musicians. Just tap one on the head while it is banging its cymbals and watch as the mechanical monkey's eyes bulge out as he bares his teeth while screeching like a very angry monkey. In a few seconds, the chimp settles down and happily returns to his cymbal playing. There are actually many people that believe this happy looking vintage toy may be the creepiest toy ever made once they see the screeching monkey's face. Following closely behind the popularity of the Musical Jolly Chimp, other Japanese toy manufacturers such as Kuramochi Shoten and the Yano ManToy Company, as well as companies in the United States and Hong Kong, quickly began producing their own versions of the much loved toy. There were battery operated monkeys and wind up ones. Some swayed to and fro as they happily banged their cymbals and other, more modern versions, learned to do flip flops. Although the outfit Charley the Chimp is wearing is different from the original clothes of the Musical Jolly Chimp, the toy is a close replica. Charlie also has the same movements and sounds as the Daishin Company toy. This vintage replica is available at Amazon. A newer version of the classic primate, Magic Monkey plays his cymbals while he scoots along the floor. Complete with chimp noises, this plastic faced monkey is available at Twisted Grins. Made by Yano Man Toys in the 1960s, Pepi the Tumbling Monkey plays his cymbals while doing his acrobatic feats. Often sold as part of a set of three musical monkeys, these cute little wind-ups play their instruments as they sway from side to side. Made by the Clockwork Company the toys are made of tin and fake fur with plastic faces. To see an entire set of these vintage classics visit The Bear Room and scroll down to the fifth toy. A modern take off on the collectible vintage toy, California Creation's Monkey with Cymbals is part of their wind-up toy line of the Not So Grand Band. The original Tomy wind up monkey would march along playing his cymbals accompanied by the five other animal band members with their instruments. The new California Creation's translucent plastic wind-up toy monkey joyously does flips and flops front wards and backwards as he bangs his cymbals together. To view this toy visit the Toy Directory. The replica of the vintage wind-up musical monkey is located third from the bottom of the page. Whether you are a toy collector or not, having a monkey playing cymbals vintage toy in your home is sure to bring many smiles to those you love.